The Briar & Leaf Chronicles » Blog Archive » Robusto - Revival of a Classic? Robusto - Revival of a Classic? A few weeks ago, I received from a friend a generous sample from a 40+ years old knife lid tin of the venerable Sobranie Virginia #10. The sample was vacuum packed in thick, freezer safe plastic film, and arrived looking more like a Slim Jim than tobacco. My friend had sent email telling me it was on its way, so the anticipation was already in top gear, and the arrival of the little sausage put that anticipation into overdrive. I didn’t instantly open the sausage-like package, but allowed the suspense to linger a bit longer, waiting for just the right moment to begin the exploration. When I finally slit open the top, fresh air crept in, coaxing just a whiff of the aroma out. One of the things I love most about opening old, puffy tins of vintage tobaccos is that explosion of scent that erupts as soon as the seal is broken. The vacuum-pack robbed me of that, and forced me to work a little harder for my first of what would prove to be many rewards. Sticking a nostril under the bag, I began to tease the still tightly compressed tobacco apart, releasing some of its goodness to the air. It was magnificent. I got an immediate but not strong impression of Latakia, riding on waves of wine-like aromas of fermented oriental leaf, with the virginias bringing up the rear. Delightful, delicate floral scents whisper softly - more like violets than the intense after-shave like aromas from some of the Lake District offerings - and are joined by soft fruity aromas of wine stewed pear and glaçée pineapple. The cigar leaf is barely detectable, but after all these years of incarceration, that’s not surprising. Cigars rely on being allowed to breathe in order to retain their bouquet. It’ll be interesting to see if they still make some kind of statement during the smoking of this treasure. Before I get to that, I’ll introduce the other contestant in this little slap-down. I’ve got an 8oz bag (remember those?) 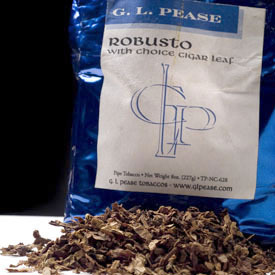 of Robusto from November, 2002 - very early in its production. I’d smoked a few bowls from it earlier on, but have kept it tightly sealed for most of its life. Robusto was originally inspired by my memories of the No. 10, so it’s worth doing a little comparison of the two. Though it’s a bit unfair to compare a five year old tobacco with one that’s got 40 years behind it, there is certainly something for your ever intrepid tobacconista to learn from the experience, so onward. Physically, these two tobaccos are quite different, the Sobranie being a rubbed up cut cake, Robusto, a ribbon cut mixture. Both approaches provide somewhat similar smoking characteristics, but I suspect some of the Sobranie’s magic lies in the pressing, and it’s coarser strands should smolder somewhat more slowly. The colour palette of the two is quite similar, though the older blend is a couple shades darker. In smoking, the Virginia No. 10 lights effortlessly, and delivers a smoke as smooth as a black velvet painting of Perry Como. The Latakia is more subdued in the smoke than in the tobacco’s aroma, but it’s still lively enough to be accounted for. What strikes me first, though, is how completely integrated the flavours are. Each individual component has merged into a single harmonious whole, and it takes some serious thought to pick out its unique contribution. I’ve smoked enough 40+ years old tobacco to know that this is quite a rare thing. But, with focus, it’s possible to identify the parts and figure out what they’re up to. The cigar leaf has softened substantially. It still provides a little twang, a soft nibble on the centre of the tongue, but I suspect it was much more assertive, or at least exuberant some decades ago. The orientals and virginias play beautifully together to provide a much more complex sweetness than either would alone. And, even in its dotage, the soft Latakia brings a bit muscle to the party and fills out the structure. It’s difficult to compare this to anything else, or even to really describe it. It’s a unique experience, and a delightful one. I’ll be quite sad when the final bowl of the sample has been reduced to ash. So, what about the Robusto? Can it fill the void when this is gone? Initially, and throughout the bowl, the Latakia in Robusto is somewhat forward. It never comes off as a “Latakia blend with other stuff,” but it’s certainly clear that it’s there. There’s a refreshingly bitter edge from the cigar leaf, and a wonderful sweetness that carries it all together. The individual components are more easily recognizable, though they’ve begun to meld together nicely. Overall, it’s a more intense experience, but still nuanced. The sidestream smoke is more astringent, a bit nose-stinging, so it’s best not to smoke this in a short stemmed pipe. The cut of this requires just a bit more care in smoking, as it’s possible to overheat the ember, bringing a sharpness to the smoke, but, delicate sips reward the smoker with a beautiful sweetness. As with the Sobranie, this burns cleanly and easily to a fine ash, though the Robusto is a little more forgiving of a carelessly over tight pack. The room note of the two is comfortably similar, and quite pleasant - if you like cigars and pure tobacco aromas. Neither will win friends amongst non-smokers or cigar haters. I like both of these in smaller bowls, and as with any blend containing cigar leaf, they’re best smoked in a single session. The so-called “Delayed Gratification Technique” doesn’t fare so well here, as it wouldn’t fare well with a good cigar. Will 35 years more age carry Robusto to the sublime heights reached by the venerable old Sobranie Virginia #10? Only time will really tell, but after this comparison, I’ve got pretty high hopes. They’re not identical twins, certainly, but are clearly from the same family. I’ll keep my eyes open for old tins of the Sobranie, but will add quite a few more tins of Robusto to the cellar as something of an insurance policy.